We know that a poorly-managed project will easily yield unsuccessful or costly results. 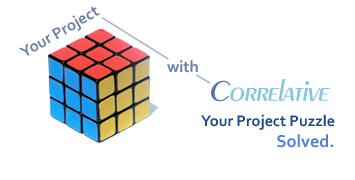 We designed Correlative from the ground up with a strong emphasis on proven project management practices in all services we provide. We are always evaluating new project management practices and tools to better serve our customers. Our project team is experienced in coordinating the diverse aspects of a complex project--from the detailed technical to the highly administrative. Our project managers are focused in providing a high degree of coordination between management, technical staff, vendors and the end-users. These project managers are focused in driving a project to successful completion, on-time and in the most cost-effective manner--all with the highest level of customer satisfaction. This is the total solution that we provide. No complex project can be successful without strong communication between the project team members and management. Our project managers are required to possess strong documentation and communication skills. Regardless of the project’s objectives, you can expect comprehensive documentation accompanying a successful project completion. Our project managers and staff are focused in leveraging the right project management tools to match the project’s and your requirements. We apply the right project management tools to aid the project team and management methodologies selected.